If you are looking for some seriously fluffy scrambled eggs for one only, you have come to the right place. 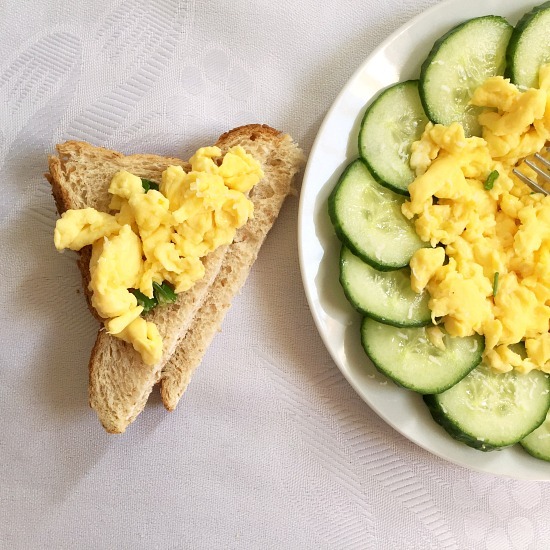 These are not ordinary scrambled eggs. 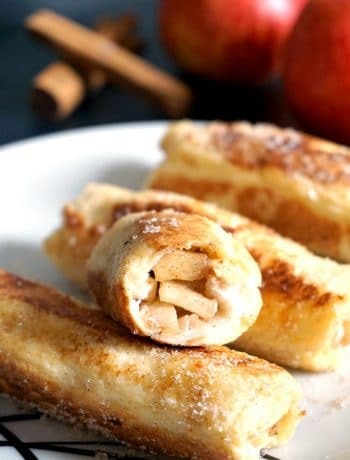 They are ready in less than 5 minutes, and make one healthy and nutritious breakfast. 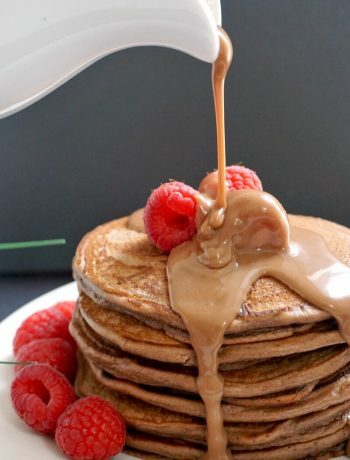 You really have no excuse to skip breakfast now. Cheap, tasty, effortless. Trust me, it takes a lot longer to queue up in the morning at rush hour to get yourself breakfast from a coffee shop. Not to mention the ridiculous price you have to pay for a take-away breakfast. Do yourself and your pocket a favour and have breakfast at home. You will love it! I know, some people may say there is no point of having a recipe for scrambled eggs. After all, everyone knows how to cook eggs, right? Well, true, but then, these are not just any kind of scrambled eggs, but the best scrambled eggs you can possibly make. And also the fluffiest. So, what is the secret? Using just a tiny little bit of butter, and a tiny little bit of milk, and a tiny little bit of parmesan cheese. You won’t believe how delicious they really are! 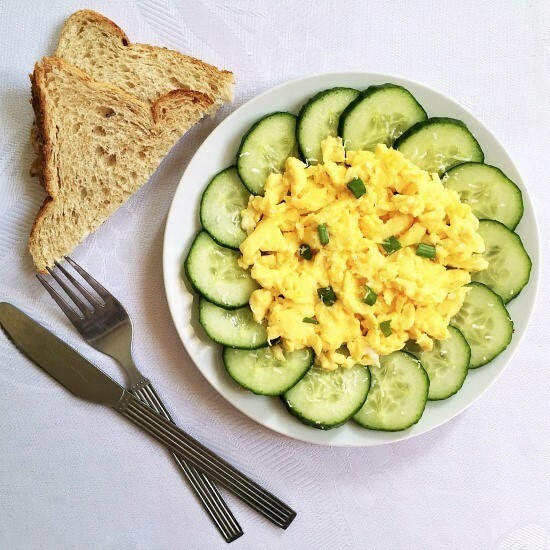 For some nice crunch, serve the eggs with cucumber and spring onions. Yum! I absolutely love eggs for breakfast, in any possible way. From omelettes to poached eggs, or just the plain fried egg, there is no better way of starting your day right. Eggs are jam-packed with protein, and essential vitamins and minerals, and absolutely fantastic no matter what. Some people worry about the cholesterol, but new studies have shown that there is nothing to worry about when it comes to eggs. 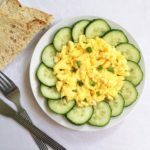 If you have a fussy child, like I do, scrambled eggs for breakfast are a life-saver when you have no idea what else to cook. I am not a big fan of cereal, they are anything but healthy, so scrambled eggs are just perfect. Serve them with toast and a cup of milk, and there is nothing tastier. I dare all fussy toddlers to refuse such a treat! By the way, has anyone figured out how can toddlers have so much energy? Such a mystery, isn’t it? I wish I had their energy, I could really do with it. Oh, well! So, breakfast! Very important, do not skip it! My parents always go for a big, huge breakfast. And they have the right idea, it really makes a huge difference to start your day full. I mean, ideally full with the good kind of stuff. Not any sugary junk. Good eating habits start with a good breakfast, trust me. So, let’s get cooking! 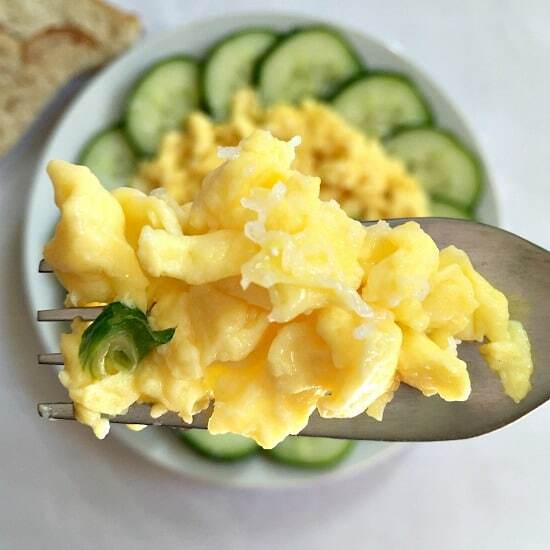 If you’ve liked my FLUFFY SCRAMBLED EGGS FOR ONE or any other recipe on the blog then don’t forget to rate the recipe and let me know how you got on in the comments below, I love hearing from you! You can also FOLLOW ME on FACEBOOK, and PINTEREST to see more delicious food and what I’m getting up to. Fluffy Scrambled Eggs for One, a healthty and nutritious breafast to start your day right. Add some parmesan and milk, and you have a delicious recipe that even fussy easters will love. Use a fork to beat them until foamy. Season with salt and pepper. Melt the butter in a frying pan, then add the eggs and leave to cook on a low to medium heat until the edges are slightly done. Using a spatula stir the eggs quickly until cooked through. Transfer to a plate and sprinkle grated parmesan cheese over. Top with finely chopped spring onions and serve with slices of cucumber.